My son was lucky enough to have the same teacher for 2 years in a row. Mrs S had taught son 2 in Prep and moved onto 1st grade this year. 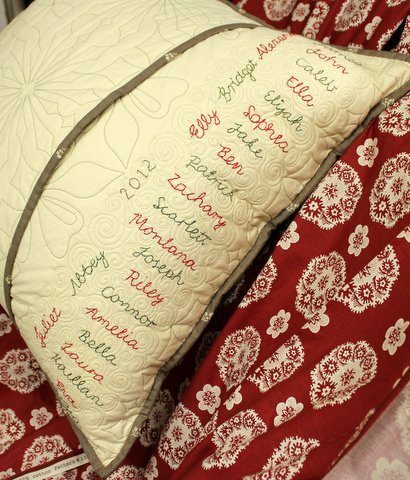 To complement the quilt I made last year for Mrs S, I made this European sized pillow/cushion with all the children’s names embroidered on the back. 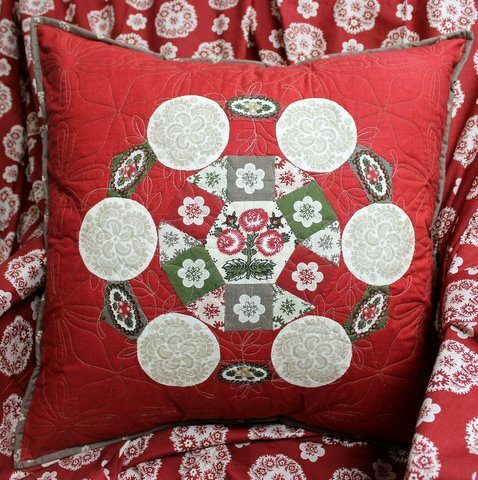 The pillow is made using EPP (English Paper Piecing) using the scraps from a Fa La La La Layer Cake and some yardage from other French General collections. 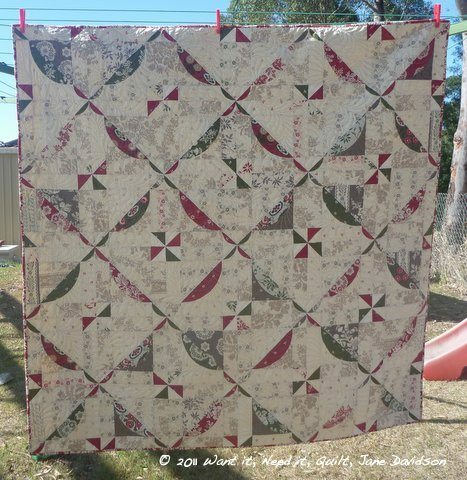 It is quilted on both sides with contrasting olive and cream threads. My little boy decided to make the teacher something too. 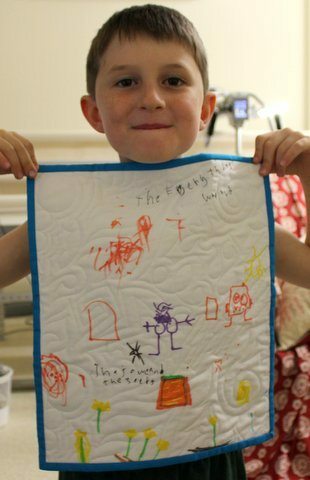 He drew a wonderful picture using the Crayola fabric pens. It is trashies and the parable of the ‘sower and the seeds’. He gave it the title – “The everything world”. I am sure there is a deep and meaningful message in there somewhere. Mrs S is a fantastic teacher. I can only hope she will apply for grade 2 next year. Thank you Mrs S for making my son’s year a wonderful, safe, happy and memorable year. The pillow with the embroidered names will certainly be a hit with his teacher. What a lovely gift for the teacher. I'm sure she will treasure this for years to come. I know I keep all of my cards and the little things that students give me. My favourite gift is the watercolour painting that one of my Year 12s painted for me as a gift this year though. It is sitting proudly on my desk in its frame at work but will be moved to my lounge room at the end of the year. As a teacher, I can tell you these gifts will be treasured forever! How lucky Mrs. S is to receive such beautiful gifts! Your son's gift will be equally treasured! What a lucky teacher to get such beautiful gifts. Your son shows a lot of talent too. Love his small quilt. When the last of my 4 children left high school I made a quilt with all MacKillop house ( the one all mine were in)signatures on it for the head of house. She was speechless so I know how much these handmade gifts mean. Just terrific! Awesome teachers are a true gift. absolutely wonderful gifts – from both of you.